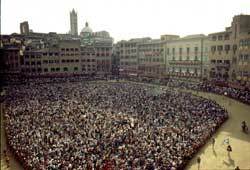 Find all Information about the city of Siena! 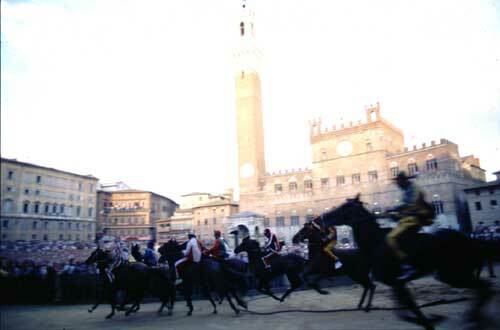 A race which lasts less than 2 minutes, is the subject of debate and competition all year round and can cause men and women to laugh or cry; such is the Palio, the greatest traditional festival in Siena. 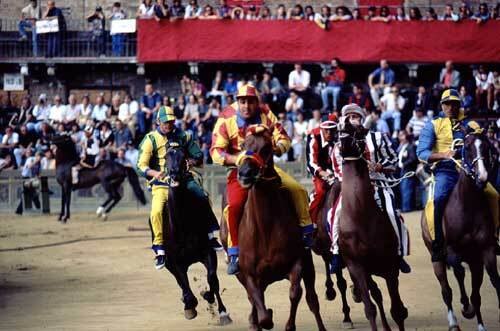 There are two palio races each summer; one on the 2nd of July, and the second on the 16th August. 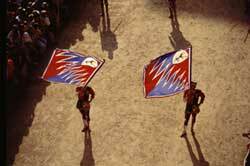 The festivities start three days prior to each Palio, although the anticipation is already evident weeks before. During this time, there are banquets, parades, blessing of the horses and celebrations of all kinds. During these days, there are events such as the assigning of the horses to the ten contrade the first, second, third and fourth trial, and the Prova Generale, followed by the dinner of the Prova Generale for each contrada. Contrada colors are worn by Sienese people, and music, singing and drumming can be heard on the streets at all times of the day or night. On the day of the Palio, spectators crowd into the piazza from noon on, willing to bear sun, heat and sweat to witness this traditional event. The more sedate will pay for seats situated around the edge of the piazza, which are usually sold out eight months in advance. The piazza is sealed off minutes before the Palio starts, and eventually (after a few false starts), the horses are off, and it is over before the dust settles. The winning contrada feasts and celebrates for weeks afterwards, with banquets, replays and much discussion, and the losing contrade can only hope that with much preparation, plotting and luck, they will fare better in the following race. A wonder for all who see, this tradition is unusual in that it is of the people of the city - the Palio is a unique phenomenon, one that arouses much emotion, an event that the Sienese people hold dear to themselves, and as such is a strong authentic tradition that is a once in a lifetime experience to witness and enjoy.